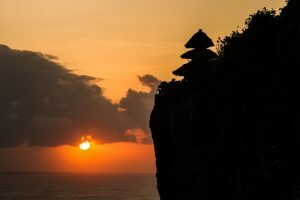 Boasting scenic and often dramatic locations, Bali’s Pura Segara are sea temples designed to appease the wild gods of the ocean and have particular significance during Melasti, the purification rituals that precede Nyepi, the Balinese New Year. At this time sacred objects are carried in long colorful processions to the sea where people bathe with their deities in a symbolic cleansing of body and soul. Pura Luhur Uluwatu clings to mighty cliffs on the southern most tip of the island where the world famous surf break of Uluwatu sends waves crashing to the rocky shore. Built in the 11th century, it is dedicated to Rudra, the god of storms and wind. Sunsets here are mesmerizing and provide the perfect opportunity to catch a dramatic kecak performance – Bali’s legendary trance fire dance. 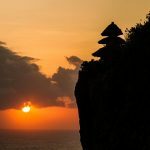 Another well-known sunset spot, Pura Tanah Lot perches on a rocky outcrop off the coast of Tabanan and its picture-perfect setting makes it one of Bali’s most visited (and photographed) temples. Pura Tirta Empul is the most celebrated of Bali’s water temples, with ornate water fountains, sacred springs and bathing pools making it a popular destination for cleansing rituals. Believed to have been created by Indra, the ruler of heaven and god of thunder and rainfall, its holy springs are said to have strong curative properties. Other water temples are built within lakes, such as the stunning Pura Ulun Danu Bratan which appears to float on the water and is dedicated to the worship of Dewi Danu, the goddess of the lake.